St. Gaspar del Bufalo was born on the feast of the Epiphany, January 6, 1786. Baptized that same day, he was given the traditional names of the magi who visited our Lord as a child. The child of Annunziata and Antonio del Bufalo, he grew up in the city of Rome, in the servants' quarters of a noble family, where his father worked as chef. As a young boy, Gaspar enjoyed visiting the markets, where the poor and the farmers from the country gathered. He reached out to them, teaching them about their faith, caring for the sick, helping those in need. He visited the sick in the hospitals, and reached out to those on the margins of society. 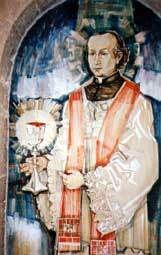 Gaspar was ordained to the priesthood on July 31, 1808. At the time, Napoleon had conquered much of Europe, including the Papal States, which were located in central Italy and ruled by the Pope. Napoleon had overthrown governments and was seeking to establish his own empire. He sought to dominate even the Church, demanding that priests, bishops, and others in leadership roles take an oath of loyalty to him alone. Gaspar refused, saying, "I cannot, I must not. I will not." For this he was sent into exile and imprisonment for several years. During that time, his devotion to the Precious Blood grew even stronger. He came to recognize in it his salvation, his hope, and the strength he needed to endure his time in prison.ÊAfter Napoleon was defeated in 1814, Gaspar returned to Rome, where Pope Pius VII asked him to preach missions to the people in order to reestablish some order in the midst of the chaos of the time. Gaspar began his work by proclaiming "peace through the blood of the cross." He called people to reconciliation - to a restored right relationship with God and with Godâs people. In order to continue his mission of preaching missions and retreats, he gathered other diocesan priests together to spread the message beyond the city of Rome. On August 15, 1815, he established the Missionaries of the Precious Blood, in Giano, Italy, where an abandoned monastery was given to the community in order to help it begin the work of proclaiming Godâs saving love through the precious blood of Jesus. Gaspar continued to bring men together to help build up his small community of preachers.ÊEventually the community would have both priests and brothers, who worked together to reach out to people who needed to hear some good news. Gaspar was especially famous for his preaching to the bandits in the small towns of the Papal States. His preaching inspired many to turn away from lives of crime and brought hope to areas heavy with crime. Gaspar died in Rome, December 28, 1837. He was declared a saint by Pope Pius XII, June 12, 1954. His feast is celebrated in the City of Rome and by members of the Missionaries of the Precious Blood on October 21.